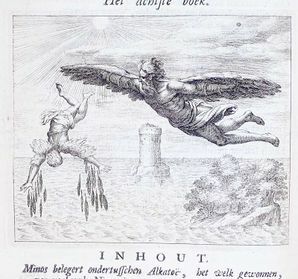 The above illustration shows the correct (right) and incorrect (left) use of Icarus wings. The Icarus wings are one of the most popular variety of arms equipment in all of Godville. Icarus wings have one of the highest customer satisfaction ratings in the kingdom! Heroes have been known to hold on to these wings long after they are outdated, and will happily trade them in for different pair, usually worse, at any opportunity. Especially fortunate heroes will be able to replace their wings after a quest. Your hero may go through two, three or many, many more pairs of Icarus wings before they change to a new item. Now that's brand loyalty! Experience has shown that no amount of pleading, complaining, or outright commanding can change the mind of a hero once the wings show up in their inventory. Your best course of action is to simply laugh and shake your godly brow as they go through set after set. Similar preferences have been observed for happy feet and dimensionless gloves. No refunds no warranties period. This page was last edited on 14 February 2019, at 17:26.